Researchers from the Pasteur Institute and Inria, with researchers from the CNRS and Paris Diderot University, and from the Institute of Science and Technology (IST) in Austria, have published two articles in Nature Communications about computer control of cellular processes. Hybrid experimental platforms combining microscopes and software are enabling researchers to interface living cells with control algorithms in real time. The two articles illustrate that these solutions make it possible to create new and easily reprogrammable behaviours of cell populations. This external control of living tissue would then become a formidable research tool for acquiring a detailed understanding of the biological role of certain proteins and for optimising bio-production processes. The goal of synthetic biology, which combines biology with engineering, is to (re)program cells in order to improve their performance in a specific task, or so that they can efficiently perform a new task. One of the challenges in this discipline is thus to bypass the limitations of existing biological systems. For example, it is hard to obtain the same gene expression in different cells, even if they are grown in the same medium. Thanks to these cutting-edge technologies, the researchers are able to provide homogeneous control of a cellular process over a very long period. Researchers from the Pasteur Institute andInria, the CNRS andParis Diderot University, and the IST Austria have developed two platforms connecting a microscope to a computer. The cells are placed in a microfluidic device in which the chemical environment can be varied or the cells can be exposed to light stimulations. A computer program decides which modifications are to be made in the chemical or light environment according to the cells' observed behaviour and the objective of the experiment. The computer also manages the acquisition of images by the microscope and their analysis, to quantify the cellular responses in real-time. In the first article, the researchers from the Pasteur Institute and from two groups at IST Austria have used optogenetics to activate the expression of a gene by exposing cells to light. A fluorescent protein is used to measure the amount of produced protein. 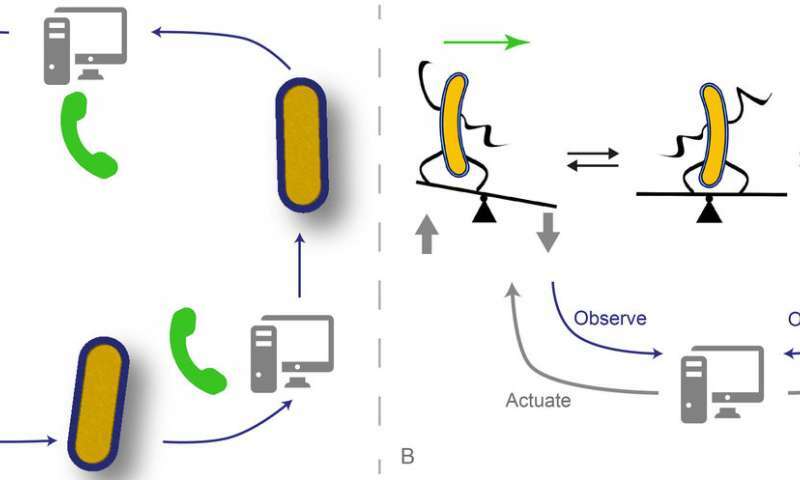 A controller, using a model of the system, can then make real-time decisions about which dynamic disturbances to apply based on the expected future behaviour of the cells. Thanks to the computer programs created by the researchers, they can control each cell individually in various ways, or create virtual communication between several cells, which circulate messages in an easily reconfigurable order. " We have managed to build a platform allowing us to design circuits that are partially biological and partially virtual. The virtual parts of these circuits can be arbitrarily modified to quickly create and explore cellular behaviors, even beyond what is biologically possible," says Jakob Ruess, co-first author of the first article. In the second article, Grégory Batt, head of the InBio unit and co-author with Pascal Hersen of CNRS/Paris Diderot University explains how they managed to place a cellular system in an unstable configuration: "We designed a computer program which aims to force the cells to take binary decisions randomly. To do this, the cells are driven to a region of instability—like climbers on a mountain ridge line—and they are then left to evolve freely towards one of the two possible stable configurations. Unexpectedly, we observed that a given stimulation, if correctly chosen, was capable of taking groups of different cells to the region of instability and keeping them there. These results could help gaining a clearer understanding of how cell populations collectively take robust decisions without individual coordination." The scientific advances described in these articles were made possible by an alliance between two disciplines that are today complementary: biology and digital sciences. Close collaboration between the Pasteur Institute and Inria, taking the form of the InBio join research group, whose aim is to develop a methodological framework for achieving a quantitative understanding of the functioning of cellular processes, is the perfect illustration of the value of interdisciplinary research combining experimental approaches with methodological developments.